Welcome everyone to THE EARFUL, a delicious piece of new content from the minds over at the OH NO RADIO SHOW. This bonus show will feature a countdown of songs we have been enjoying within our ONRS community giving you all a taste of musical variety and maybe even turning you onto to something you'll like! We hope to do these shows often and would love your feedback and input as well on what we should be listening to. Hear that noise behind you?! 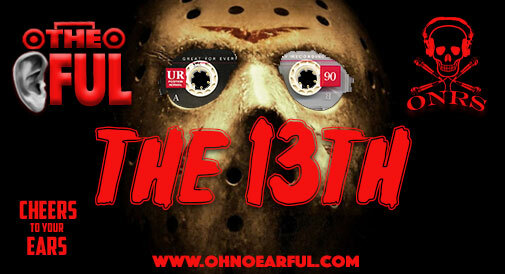 Oh wait that's just Earful The 13th ready to murder you with vicious jams! Sir Robert Bryson Hall II (born January 22, 1990), known by his stage name Logic, is an American rapper, singer, songwriter, and record producer. Daniel Quine "Dan" Auerbach is an American musician, singer-songwriter, and record producer, best known as the guitarist and vocalist for the Black Keys, a blues rock band from Akron, Ohio. Daniel Victor "Dan" Snaith (born 1978) is a Canadian composer, musician, and recording artist who has performed under the stage names Caribou, Manitoba and Daphni. Comprised of 8 ultra-funky musicians, Magnum stayed together only long enough to put out this album 1974. Their combination of jazz & funk was advanced for its time. Sofi Tukker is a New York-based musical duo consisting of Sophie Hawley-Weld and Tucker Halpern. King Complex is an intrepid project that recontextualizes organic instrumentation and pop compositional approaches with the daring innovations currently happening in electronic music. This entry was posted on Tuesday, July 11th, 2017 at 7:39 pm	and is filed under DefaultTag.